100,000+ customers tried 'em and loved 'em. What's the difference between breakfast and brunch? CHAMPAGNE! Dress up a nice bottle with this super-soft wine tote! Make somebody smile INSTANTLY by sending them $100 of wine by email. Make somebody smile INSTANTLY by sending them $50 of wine by email. Make somebody smile INSTANTLY by sending them $20 of wine by email. Make somebody smile INSTANTLY by sending them $10 of wine by email. Travel is fun - traveling with a suitcase full of wine is a REAL trip. This high-tech, gorgeous rolling suitcase cradles your wine safely while you roam around the country. And we pre-packed it with 8 bottles of award-winning top shelf wines (including Matt Parish Napa Cabernet, Scott Kelley Willamette Pinot, and 6 other stunners)! But we only made 200 of these limited edition suitcases with a little nakedwines.com plate so they're sure to fly! Act now or you may be out of luck. These are fancy wines that are sure to impress. If you want the most elegant wines we have to offer, here’s a great sampling. These wines are all crowd-funded by 100,000 of our customers. 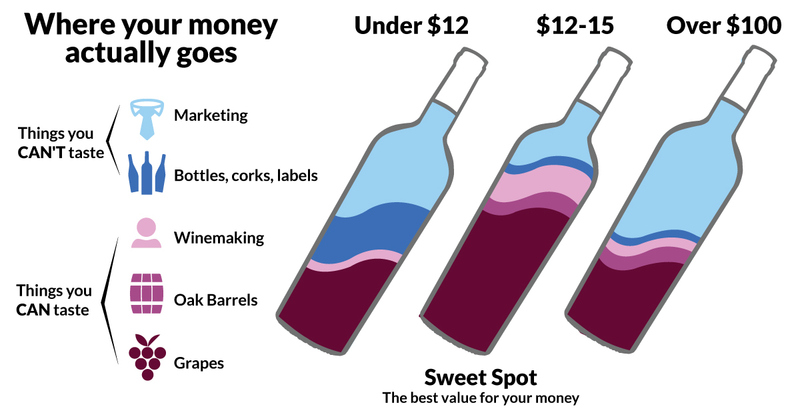 So we used that money to hire the best winemakers and buy the best grapes and we didn’t waste a penny on marketing or branding. If you want to have an amazing wine that tastes like a hundred bucks, keep this pack on hand. You never know when you’ll need to impress somebody. Now these 6 sumptuous showstoppers are signs of a dinner party done right. Includes Scott Kelley's velvety smooth Oregon Pinot, Stephen's beautifully crafted Old Vine Zinfandel, Wayne's elegant California Sparkling and a Napa Cab from Matt that'll turn your bowtie upsidedown. You get everything you need to keep your guests happy - and get a whopping $72 savings! Hundreds of thousands of customers like you rated and scored our wines. After collecting over one million reviews, we know that these are some of the most popular wines on the site. You’ve got big and bold reds, some bright and refreshing whites, and everything in between. You all have a very diverse palate and it shows in the rankings. This case is the perfect way to discover 12 of the most popular wines on the site, and will make you a smarter shopper. Everyone loves sparkling wines... and this HUGE savings will make you love them more. So here's a pick of our best bubbles, including a gorgeous Moulin Champagne Rosé and award-winning Prosecco. Everything you need to keep the celebration going! Bust out the waffle iron, whip up some eggs, and start crisping bacon – we've got the rest of brunch covered, thanks to these scrumptious and indulgent weekend wines. Includes crisp and elegant Rosé, creamy whites, and plenty of mimosa-ready bubbly! ...the best bit? You can help yourself to a second (or third) helping, guilt-free – because these wines are yours for an everyday drinking kind of price. Keep your Angel-funded wine nice and cozy inside this sleek, collapsable tote! Featuring supersoft felt and sturdy stitched handles, this classic grey carrier makes an excellent gift (even if it's just for you). Our advice? Pick up a few, so you're always prepared to haul wine in style.